Boho-chic looks stormed Indio, California last weekend for the final of two weekends of the Coachella Music Festival. Diane Kruger and Joshua Jackson were ones of the stylish pair at the festival. She looked calm and relaxed in her snappy short dress with animal print and his shirt tied around the waist. Diane chose snakeskin handbag and for the footwear gladiator sandals so hot and popular this season. Khloe Kardashian shone in a simple and elegant grey dress. Attire of her little sister Kylie looks exotic, but Kendall Kardashian struck down everyone by her boho-chic shorts with rebellious t-shirt and accessories. 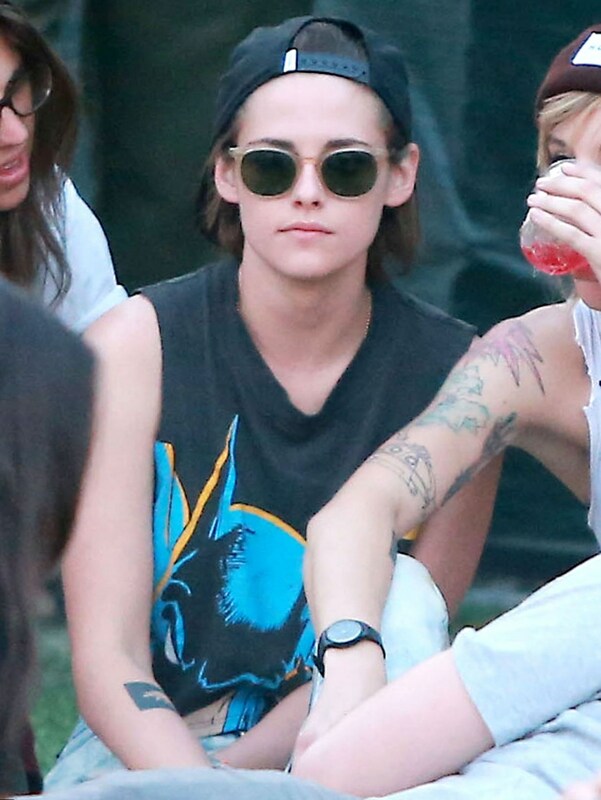 Kristen Stewart wore batman’s t-shirt and fancy glasses. She was caught with her rumoured girlfriend Alicia Cargile. Kate Bosworth was absolutely astonishing in a cool lace-and-linen Etro jacket and basic white dress. She completed look with Ray-Ban glasses, mini top-handle Coach purse and boots from her Matisse shoe line. Love couple, dressed in the same style, Gigi Hadid and her young boyfriend Cody Simpson looked like flower children. The Australian singer draped over his shoulders ocher poncho. Also he donned white Harley Davidson t-shirt and navy hat with wide brim. His amazing girlfriend Gigi wore simple white dress with ASOS collar and ASOS traveller pouch necklace. The top model Behati Prinsloo shocked with her frank top, cut-off denim shorts and Ray Ban specs. She with her husband Adam Levine from Maroon 5 posted foto on Instagram with bandannas over their faces. 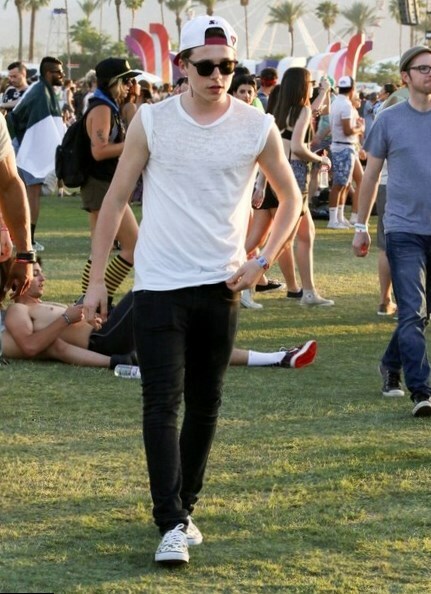 The 16-year-old David and Victoria Beckham’s son Brooklyn visited his first music festival in a simple black-white look. A floral maxi dress is must-have of this season and Daisy Lowe looked fabulous at the Coach private brunch at Soho Desert House. The famous singer Fergie at the Coachella Music Festival was with friends, but where was her husband Josh Duhamel? She looked pretty bohemian in suede vest with fringe and scarves with animal print. Also she chose massive rings for both hands. Girls from Haim looked awesome in their harmonious outfits. Alana and Danielle preferred denim shorts and massive boots, and Este was in a short black dress and her lips, nails and bag were in the same color. The British extravagant model Jourdan Dunn killed everyone with her crochet playsuit and gladiator sandals. Her curly lilac hair harmonized with silver accessories. Katy Perry shone in a long translucent dress with flowers by Australian fashion label Alice McCall. Her hair was braided, and lips were red, as usual. 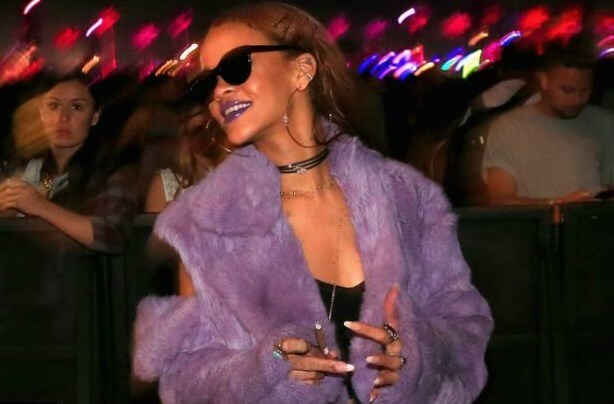 Absolutely inimitable was Rihanna in a purple faux-fur coat from Marques Almeida’s Fall 2015 collection and pink cult boots by Dr Martens. Rihanna is Rihanna, she can do everything that came into her head.